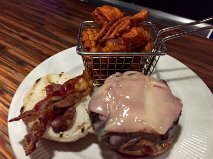 Maui Waui Our seasoned beef burger on pineapple mayo topped with pineapple bbq sauce, sliced ham, cheddar cheese and ancho bacon - comes with your choice of side. 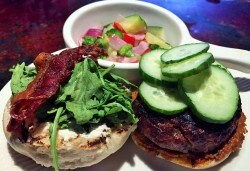 Check out some of our new menu items! We added a new salad, flatbread & two sandwiches starting July 5th!